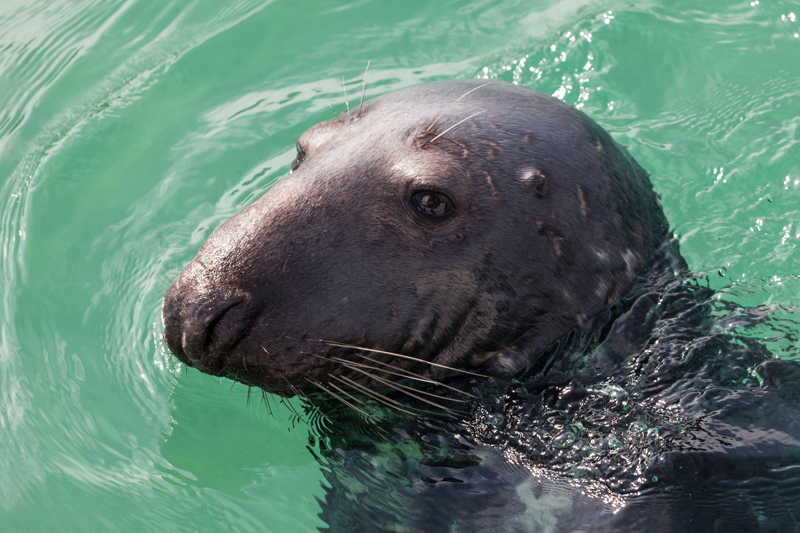 Step into the UK’s offshore waters and you have the chance to encounter some amazing marine life. With this in mind I travelled from my landlocked home in Oxford to the Cornish coast. Mask and fins were packed, along with a shiny new GoPro camera that I wanted to test underwater ahead of a planned trip to the Pacific next year. Every summer, the world’s second largest fish visits these shores. Mouth agape, funneling millions of tiny plankton, the giant basking shark (Cetorhinus maximum) arrives from the deep Atlantic. I spent a day with underwater photographer, Charles Hood, on a shark watching trip. Leaving from Penzance, our small RIB boat hugged the coast. We passed beautiful Porthcurno Beach and the Minack Theatre, rounded Land’s End and headed out to Longships Lighthouse. To no avail. Conditions were good but this big fish was hiding in an oh-so-bigger ocean. On day two of my ocean adventure I joined up with Newquay Sea Safaris in search of blue sharks (Prionace glauca). Skipper, Chris Lowe, took us 20 miles off coast and began to chum the water with ‘Rubbie Dubbie’ (don’t ask!). Plenty of debate has rightly been held over the ethics of shark diving but these trips are run sensitively and in small numbers by a company that is keen to raise awareness of the plight of British sharks and their conservation. As we bobbed on the calm sea, blue jellyfish would pulsate by, occasionally joined by inquisitive common dolphins (Delphinus delphis). I was fortunate to be in the water as several dolphins circled the boat, their clicks no doubt questioning the presence of a caged human in their underwater world. Hours passed…but the tell-tale shape of a sharks fin never broke the surface. Our boat, Atlantic Diver, turned for home and I was left to ponder the impact of overfishing. The blue shark – classed as Near Threatened on the IUCN Red List – is not protected. Up to four million sharks, mainly blues and makos, are estimated to be caught every year in the North Atlantic (rising to a horrific 100 million worldwide). So is it any surprise we failed to see this top ocean predator?